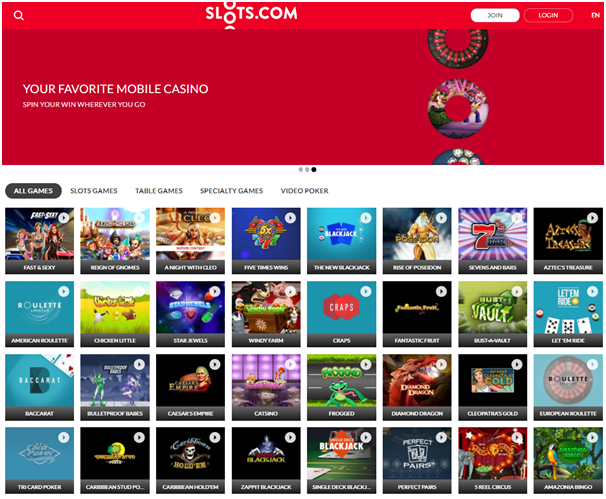 Slots.com is perfect US friendly online casino to play slots with Bitcoins. The games here are powered by Real Time Gaming software and the casino is licensed in Kahnawake Gaming Commission. It is part of the Bodog Entertainment Group of online casinos and offers games that are fully optimized to play with instant play even on your cell phone Slots.com Casino is a TST certified casino which means that all games have been tested to ensure that they all work on a Random Number Generator system which implies fair play for all users. RGT games have excellent graphics and sound with the smooth functionality and play speed. 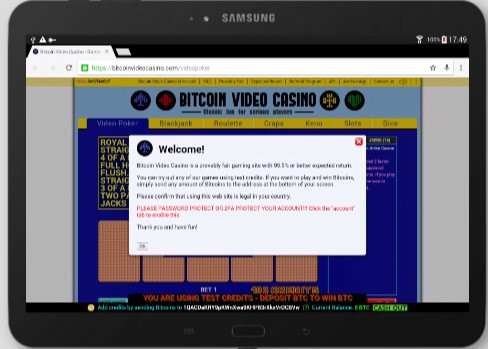 The one unique thing about this casino is that it offers Bitcoin deposits to play wonderful slot games. 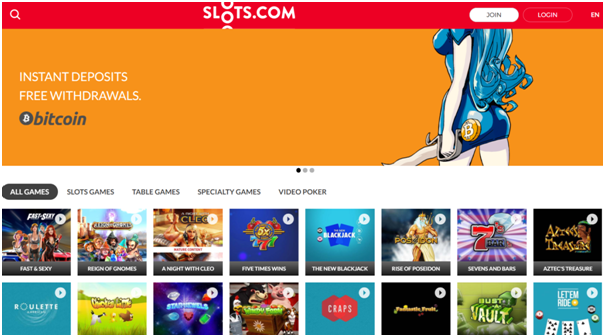 As the casino name suggests Slots.com offers slot games of various theme and variety. With over 150 games there are classic slots, 5-reel slots, bonus slots, progressive slots and many more. However, they also have a wide array of other casino games available. Among table games you will find Roueltte, Craps,Baccarat, New Balckjack and poker games. Speciality games include Bingo, Keno and Scratch cards. Slots.com Casino uses the latest encryption technology to ensure that your personal information is kept private. The site’s The Random Number Generator (RNG) is tested for transparency by Technical Systems Testing (TST). This ensures that the software of the online casino remains transparent and honest. All the games are available instantly to play and you need not download anything. Also all games can be played for free without creating an account. This means that you can try out every single game on the site without giving them as much as a username. You can just click on the site, navigate to the games, and start playing right away. 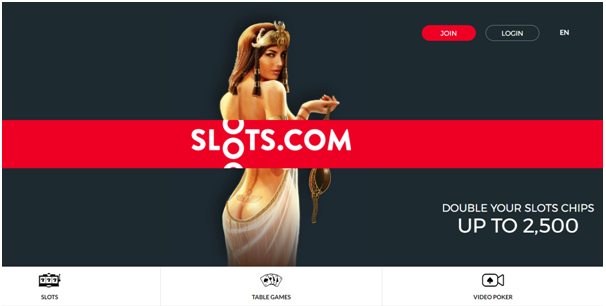 If you like the casino and are interested in playing for real money then you can register yourself and open your casino account. 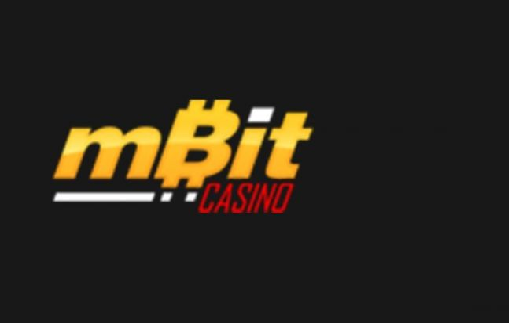 As mentioned above the casino is Bitcoin casino so it offers Bitcoin bonuses or deposit match bonus on your first deposit equal to one Bitcoin. While this is going to fluctuate in its value, it’s still a fairly nice welcome bonus. Also get 100% match bonus up to 1 bitcoin! You can take advantage of a special promotion that consists of a 100% match bonus worth up to 1,000 Slot Chips! Note that your deposit + bonus amount is subject to playthrough requirement, before any winnings can be withdrawn. Simply log in and tap on the profile icon in the top right corner. Select “Bonuses” from the menu and choose a bonus from the list. For bonuses that don’t require a deposit, the Slot Chips will be automatically added to your account after you’ve claimed the bonus from your list of bonus offers. If a deposit is required, you will need to claim the bonus prior to making a Bitcoin deposit. Once the deposit is made, your bonus will be activated and the Slot Chips will automatically be added to your account. 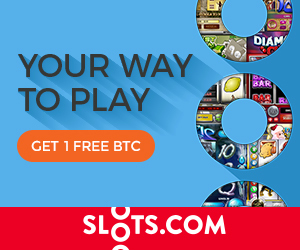 Slots.com only accepts Bitcoins as deposits and Withdrawals. All deposits and withdrawals are done through Bitcoin only. Your Bitcoin wallet provider might charge fees or set limits for each transaction, but these are unassociated to Slots.com. To get started, you need to select a Bitcoin Wallet Provider and purchase your first bitcoins. Once this is set up, you can think of your provider as an app that allows you to send and receive secure transactions quicker than a bank. Transactions are processed using unique “wallet addresses” that allow providers to identify where the funds should be sent. 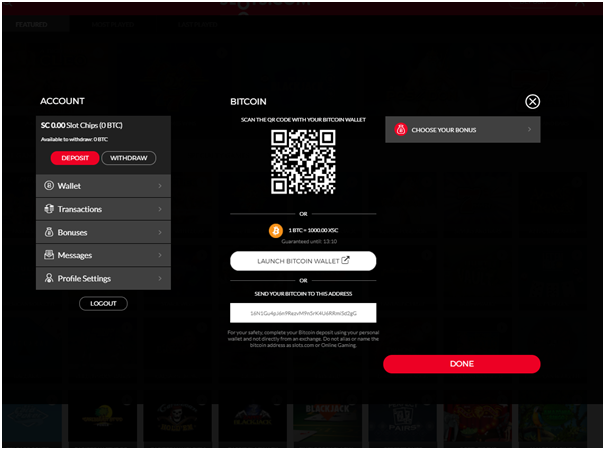 To make a deposit, you will need to copy the wallet address given to you on the deposit page of Slots.com, and paste it into your Bitcoin Wallet. To make a withdrawal, you will need to retrieve your wallet address from your provider, and paste it into the appropriate field in our withdrawal page. 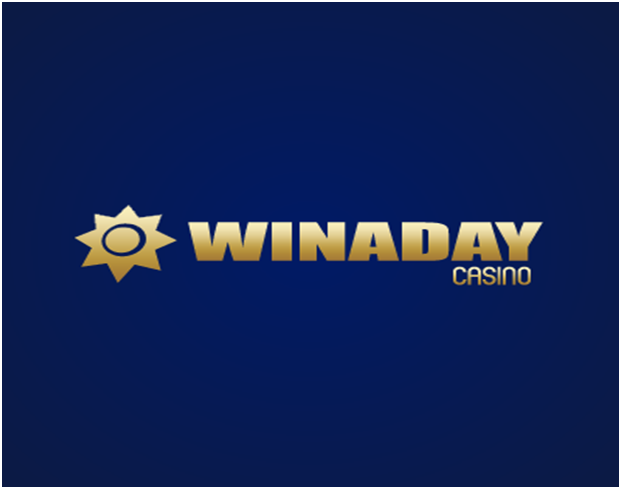 As this online casino is new at present much is not mentioned about the customer support at this casino. Only there is a contact form to contact the casino. ← What are best Dogecoin online casinos of 2018 to play real money slots?